One bedroom apartment with eat in kitchen in the heart of the city center. 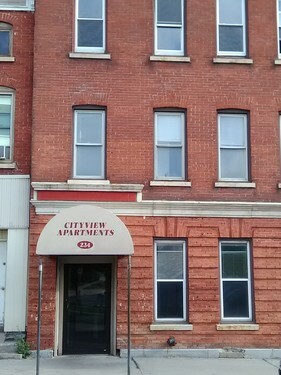 City View Apartments. Amazing location. Your home would be steps from River walk Park, along the Black River. Walk to bars, restaurants and shopping. Leave the car at home. Large parking lot. Very reasonable utilities. Secure and well maintained building. 24 hour laundromat across the street. AVAILABLE NOW!! SORRY NO PETS ALLOWED. Included in the rent are water, sewer, and trash so you can't beat this price! Only 595.00 a month!!! Facetime/Skype video tours available upon request Call Conley's Rental today at 315-405-8197.